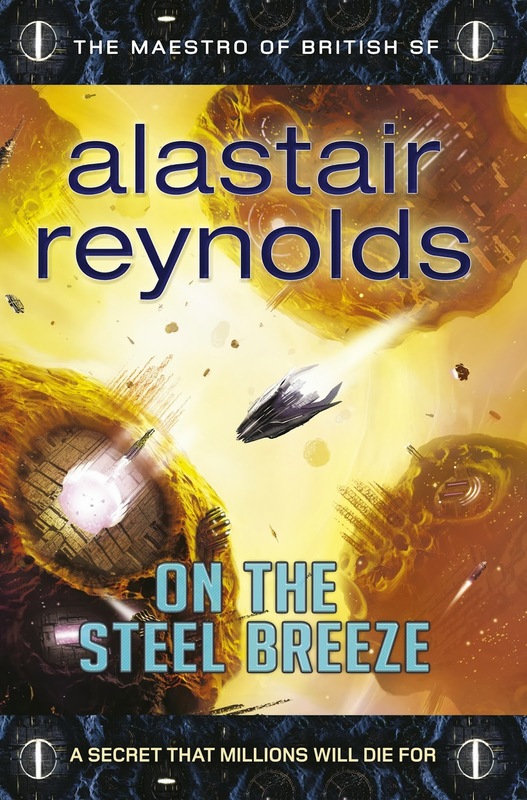 Another year and thus another Alastair Reynolds novel is released. Well, strictly speaking, we did not get a novel in 2017 – but we got two in 2016 (Revenger and The Medusa Chronicles). And Elysium Fire was released in January. So its not all bad – right? Elysium Fire is the direct sequel to Aurora Rising, a standalone novel set in the Revelation Space universe released in 2007. These two novels exist quite separately from the larger RS-verse. They are set in the Glitter Band – a world of thousands of the habitats orbiting the planet Yellowstone in the Epsilon Eridani system. The system being the traditional setting for Revelation space stories. I admit that despite being an avid fan of the author I did not read Aurora Rising until last summer. But I did not regret picking it up. 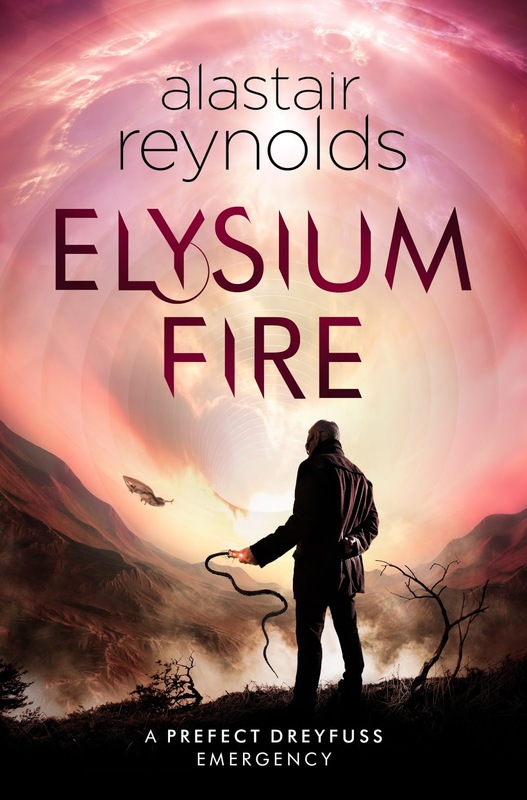 Below you can read my Elysium Fire review and discover if the sequel can match expectations. Elysium Fire starts with Inspector Dreyfus right in the thick of it. He and his colleagues from Panoply must investigate a number of highly suspicious deaths that have occurred on the orbital habitats of the Glitter Band. The over 50 victims died when their neural implants cooked their brain. At first none of the victims have anything in common. They died going about their daily lives. Supreme Prefect Jane Aumonier is trying to keep the investigation quiet. A widespread panic would only incite the secessionist movement started after events of Aurora Rising (previously The Prefect). By investigating the beta-level simulations Dreyfus slowly uncovers a pattern amongst the victims. Each had a penchant for risk taking – the last victim was a fraudster who got on the wrong side of the Ultra’s. Meanwhile Dreyfus has to deal with secessionist Devon Garlin who accuses the prefects and Dreyfus in particular of usurping too much authority. Wherever Dreyfus is going Garlin seems to follow him. Before long Dreyfus along with prefects Sparver and Ng uncover a secret, but now defunct, medical facility called Elysium Heights. From scattered clues and unlikely help from A.I. Aurora they discover each of the victims had their implants inserted there. The race is then on to discover who is behind the implants malfunctioning and how many potential victims there are. The story also moves to Chasm City – with Dreyfus investigating the ancestral home of Julius Devon Garlin Voi. Immediately this ups the stakes. He is accompanied by Detective-Marshall Del Mar, based in Chasm City. In a nod to Revelation Space she describes her ancestral roots on Yellowstone. Her husband and wife were among the Eighty – a group of people who had their minds scanned in order to become true immortal Alpha-level simulations. Del Mar had doubts about the process – orchestrated by Calvin Sylveste – but her spouses went along with it. They died when their simulations malfunctioned after a year. I won’t reveal more of the story in this review. What I have described is hopefully enough to make you want to pick up the novel yourself. Elysium Fire takes a while to start properly. The author takes care to set the stage and describe events that happened during Aurora Rising. It is not until the second half of the story that the stakes truly start to matter and character development fleshes out. I suppose it is a good thing that there is incentive to keep reading, but the premise of the story might not convince everybody. There are also problems with the main character – Tom Dreyfus. His background is still fuzzy and his motives unclear. We know he has a strong distaste for crime and he is an ethical man, but his flaws appear superficial. The character Devon Garlin feels like an alter ego to challenge Dreyfus, but it remains unclear how Garlin can get so easily underneath Dreyfus’s skin. Despite references to Revelation Space there are notable differences in style. Elysium Fire is not hardboiled in the way Chasm City is – or the author’s recent novel Revenger. There are references to all sorts of bodily harm, but the story lacks a true villain/hero such as Tanner Mirabel or Bosa Sennen. Elysium Fire is also not a hard Sci-Fi work. There is no lengthy exposition describing orbital mechanics, construction of space stations or development of society. There is some, the Glitter Band is well-described, but not in detail. All these changes from his prior work feel like an attempt to make the story more accessible – and it works! Despite Elysium Fire not quite meeting the standards a die-hard fan might expect it is easy to read. No real prior knowledge of Revelation Space or Aurora Rising is necessary. Author Alastair Reynolds does show his work revolves around certain themes. Yet again a lot of the story involves the dark secrets of a family – in this case the Voi family – that spans hundreds of years. In a nod to Revenger they employ a doctor who is less than ethical. Reynolds also describes the use of third or neutral gender pronouns. One of the victims of killer-implants uses ‘they’ instead of he or she. In his Poseidon’s Children trilogy Reynolds used the word ‘ve‘ for characters with indeterminable genders. From the Sci-Fi viewpoint this makes perfect sense – changes in society and technology would permit every possible gender. This was my review of Elysium Fire. I think it was a good book, but not the author’s best. I enjoyed it more than the Poseidon’s Children trilogy but it cannot match the novelty of Chasm City, Terminal World or Revenger. Author Alastair Reynolds will be back next year with Revealer – a sequel to Revenger.